I’m so excited to introduce you all to one of my sweetest friends and fellow creative business owner, Katie Cochara. She’s INCREDIBLY talented, not to mention sweet and fun, and a fellow dog mom. What’s not to love?! 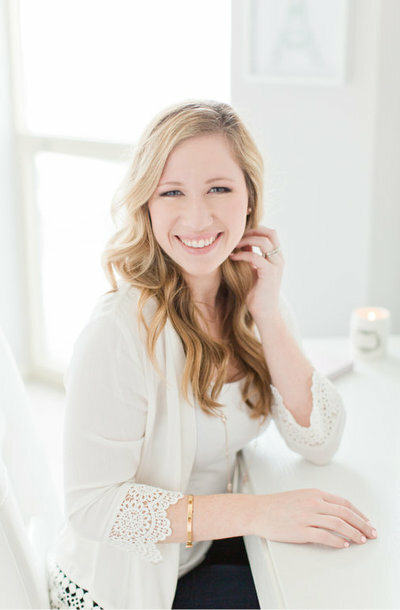 Katie is the owner of Bluebird Paper Company, a Naperville based invitation and stationery business. She seriously blows me away with everything that can do. She has a gift for illustrating architectural works, paying attention to the smallest of details, and exceeding her client’s expectations. This week, I had the pleasure of interviewing Katie and asking her some questions that would give you all a better understanding of who she is and what all she does…because y’all seriously need to know this amazing lady! Read below to learn more about Katie! 1. Where can someone typically find you and what are you probably doing? Although I LOVE Chicago, spend lots of time there, and often meet my clients there, on a normal daily basis you can find me working away in my home office in Naperville! My home office is one of the biggest rooms in our house, and it is dedicated entirely to running all of the day-to-day operations of Bluebird Paper Company. It’s where I take calls, do video chats with my brides (and grooms! ), it’s where I draw inspiration from my blooming garden, and it’s where I handle all of the design, editing, assembly, and shipping of my couple’s custom creations. I even recently brought the operation of envelope printing in-house as well, and you’ve guessed it… it all takes place in my home office! When I am downtown though, you can typically find me at Soho House meeting with brides, grooms and other wedding vendors! If I’m not working though, my choice is either to be a Wrigley field cheering on the Cubbies, or taking in a show at beautiful concert venue like The Chicago Theatre with my husband. We also love dining downtown – some of our go-to’s are Green Street Smoked Meats (those burnt ends, though! ), Ramen-san, and Little Goat. 2. What’s your favorite month for weddings? August – hands down! Because of the nature of wedding invitations and wedding stationery over-all, my busy season really kicks off in January and runs pretty heavy all the way through June. Once July hits though, I really get to settle down a little bit and relax. By August, tons of wedding day photo galleries from my couples start to roll in! Nothing makes me happier than receiving emails from my couples days (sometimes even HOURS) after their wedding, telling me how amazing and lovely their wedding day was, and how the special little touches that I created for them like their programs, menus, or table numbers made such a great impact on the overall look and feel of their day. And the real bonus is when a couple sends me the full gallery link from their wedding photographer – that is just the biggest cherry on the cake. Because I serve couples all over the country, I don’t often get to meet everyone that I design for, but getting to see the smiles on their faces on their big day, and images of their wedding invitations styled with their heirloom jewelry, bouquet, and other personal accessories just totally make all of the hard work that I put into everything SO worth it. When all is said and done, I #doitforthebrides all day, every day. Bridal bliss is my constant goal. 3. Describe what you do. What’s one piece of advice you’d give to someone who’s in need of a stationery designer? In short, I design custom luxury wedding invitations and stationery products for couples all across the globe! In detail though, I meet with brides in person or talk with them over the phone, to get a sense of what they are looking for invitation-wise. It all starts with the invitation. Then I put myself in their shoes and try to envision exactly what it is that they want to achieve with their wedding invitations and stationery overall. I take their ideas, their dreams, their budget, and I match up their style with the perfect envelopes, paper, printing method, ribbon, design idea, font, and create a one-of-a-kind custom look that perfectly suits them and their personal esthetic. The biggest piece of advice that I would offer to someone who is in need of a stationery designer is to do a ton of research before reaching out. Really take the time to observe different stationery designers’ styles, pricing, strengths, limitations, etc, and reach out to the ones that check the most boxes for you and your situation. I can’t even tell you how amazing it is when a couple comes across me either via The Knot, Style Me Pretty, Instagram, or through a referral from another wedding vendor, and then takes the time to really observe my styles, design strenghts, price points, etc. That way, when they do reach out to me, we already know that these stars are going to line up really well and it’s going to be super easy for me to shine brightly, do what I do best, and just be a rockstar designer for them! It’s a lot more challenging when a couple reaches out with an inspiration image from a different designer who maybe has an esthetic that doesn’t quite match up with mine. I’m always up for a good challenge, but I find it easier to flow creatively when the starting point for a design is already within my wheelhouse. 4.What’s your favorite stationery/invitation trend? My favorite invitation and stationery trend right now is the use of wax seals! Wax seals can be used in such a wide variety of ways, beyond just the standard wax seal on top of a ribbon within the invitation suite. We can use them as a design element on ceremony programs, your guest’s menus, as a sealer for an inner envelope – you name it! Have you ever seen the commercial for Frank’s Red Hot Sauce? The tag line is “I put that sh*t on everything” and I sort of feel that way about wax seals too, haha! Does it have a flat surface? Wax seal. Is it being mailed? Wax seal. 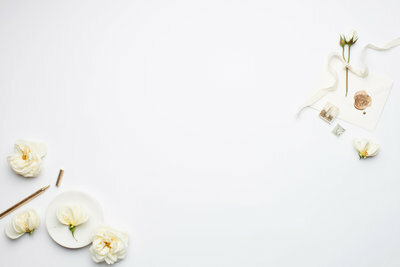 Need something cute to add to your wedding favors? Wax seal. I could go on and on! 5.What separates you from the other stationery designers in Chicago? On one hand, literally everything separates me from other stationery designers in Chicago, but on the other hand, we all share one common thread – a love for weddings and a passion for design. Bluebird Paper Company is my full-time job. It was the brainchild of my dad and my husband (before we were even married) and it was founded in a tiny apartment in Lisle, Illinois on a make-shift desk that was made out stacked plastic tubs – fancy! It was founded out of fear, excitement, passion, and a desire for a better life for me and my future family. And truthfully? It was founded for my future brides as much as it was founded for myself. Like I said before, I #doitforthebrides. 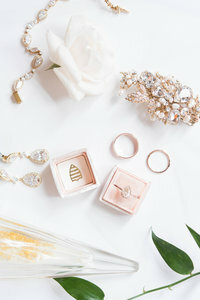 My own wedding planning process that I went through five years ago was so stressful and overwhelming because of the circumstances that were going on in my personal life at the time – a family tragedy, a job change, and a cross-country move all within months of my wedding – so I can totally relate to the hectic lives that my brides lead and can really sympathize with the baggage that they might be bringing into any given situation. My ability to empathize with my couples and be their teammate, advocate, and advisor in a lot of respects, is what ultimately sets me apart from other stationery designers in Chicago. 6.Pick ONE brand. Which one speaks to your personality and style the most? Kate. Freaking. Spade. (Insert all the ‘Dancing Girl’ emojis here!) When confronting almost any design dilemma I often ask myself “What would Kate Spade do! ?” and then I go in that direction. To me, Kate Spade is just the Holy Grail of impeccable design. I’ve pretty much never met a Kate Spade bag or accessory I didn’t instantly love. Kate Spade has managed to strike the most perfect balance between luxurious yet attainable, classic but whimsical, and timeless and fun all at the same time. Talk about branding victory! Two extremes – nature and architecture. I could go on the Chicago Architecture river boat tour a million times and literally never tire of it! I feel like every time I look at a new building or house I find something else that I didn’t notice the time before. When I was little I thought that one day I might be grow up and become an interior designer. I was (and still am!) fascinated by buildings, homes, and different ways to make those spaces sparkle. Nature is my other true love. I love gardening, landscaping, caring for my plants, and enjoying the beautiful blooms that develop from a plant that has been well cared for. You’ll find tons of aspects of my two loves throughout all of my stationery designs – because my two favorite things to draw are flowers and buildings, you’ll notice those items throughout many of my invitation collections. 8. How did you get in the wedding industry? How long have you been in business? I really got into the wedding industry after some encouragement from my husband and my father in the wake of really difficult times. I’m a self-taught artist with a business degree and a passion for all things wedding, so it really made a ton of sense. I started off by doing small invitation projects for friends’ events like baby showers and birthday parties as a hobby, and then did all of the stationery for my own wedding 5 years ago. At that time my now-husband and I were in the middle of the biggest and scariest event in ours, and our family’s, lives. A few months into our engagement, my future father-in-law suffered a massive life-altering stroke that has left him with permanent disabilities. Although I’m from New Jersey, my husband is a Chicago native, and to this day this is where my in-law’s reside. In the days and weeks following my father-in-law’s stroke, it became clear to us that we would need to leave our jobs, apartment and lives in New York and move to Chicago to help our family, and so that’s exactly what we did. We picked up and moved about 2 weeks before our wedding, got married and went on our honeymoon, and then came back to Chicago to settle in to our new lives as a young married couple. It was in the first few months of being a newlywed (and an Illinois resident!) that I filed the paperwork with the Illinois Secretary of State to make my stationery business official. I filed my paperwork in August 2013, went full-time with it in 2015 and have never looked back! 9. Do you have a team or people that help you on occasion? Tell us about them! I sort of touched on this in the segment above, but my ideal client is someone who wants to work with me because they already love my style and my esthetic and want me to add my own special touches to a design that is catered specifically to them. Ideally, I also love when a client allows himself or herself to let go of the reigns a little bit and just let me do what I do best – create. I’m totally Type A and I micromanage every aspect of my life so I totally get wanting to be in control at all times, but sometimes just taking a step back and letting the professional do their thing and trusting that it will come out the way that you want is just the best possible thing. Beauty can happen in the most unexpected of ways, and if we’re so busy trying to control how that beauty should come about, sometimes we miss out on the beauty that could have been if we had just let it occur organically.